Philipp Emmanuel Bach (1714-88), whose collection of six sonatas published in 1744 was dedicated to Duke Carl Eugen of Württemberg (later the Stuttgart employer of Jommelli), and composed while he was employed at the court of Frederick II of Prussia (who had not yet won his epithet as ‘the Great’). Thus these sonatas date from before JS Bach’s visit to his son in Berlin that spawned The Musical Offering (1747), and their stylistic peculiarity reconfirms the inadequacy of clumsy attempts to categorise mid-18th-century composers who straddled the so-called ‘late Baroque’ and ‘early Classical’ periods. Esfahani’s booklet-note provides the listener with a convivial commentary in which he draws attention to CPE Bach’s ‘Janus-like musical personality’ – nowhere more apparent than in the juxtaposition of recitative-like introduction, an intricate Adagio non molto and an extrovertly contrapuntal conclusion in the final sonata (H36). It is apt that Esfahani plays on a copy of surviving instruments by the Berlin court instrument-builder Michael Mietke (from whom JS Bach bought a two-manual harpsichord for the Cöthen court in 1719). There is an unpredictable lute stop used briefly in the Andante of H30, a gentle exploitation of dissonances throughout the Adagio and Vivace of H33, and Haydnesque playfulness in the finale of H32. 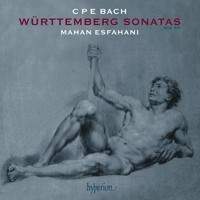 The elusive fusion of thematic intricacy, ‘Baroque’ rhetoric and ‘proto-Classical’ Sturm und Drang offered by the instrument are caught perfectly by Esfahani’s supple touch and disarming sense of rhetorical pacing.